Seth Coate is a wide receiver currently playing with the Ottawa REDBLACKS. 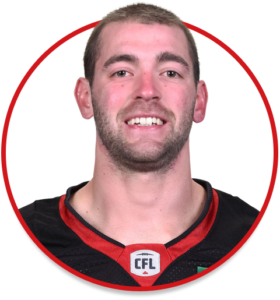 Signed with the Ottawa REDBLACKS as a free agent on May 17, 2018. In his last season with the Cougars, Coate set a single season record in 2016 with 25 receiving touchdowns, including three in the 2016 NAIA championship game. During his whole collegiate career, Seth recorded a total of 3,505 yards and 51 touchdowns, and during that time was able to put up an impressive number of 17 games with 100 or more receiving yards.